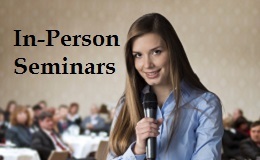 One-on-One Coaching: If you need more personal or customized results, have one of our presentation coaches come to you! We can deliver custom coaching for one person or 100 people, and we can design a program specifically for your needs or challenges. For more information, click here.